Last week was one of the harder weeks for me in Vietnam; I’ve been missing home and not feeling my greatest. With that being said, this weekend was much needed. Our original plan was to spend the weekend away on a short trip, but I’m so thankful those plans changed. Saturday ended up being a low-key day in Hanoi; it seemed like forever since I’d had one of those, and Sunday we went on a day trip by motorbike to the country and mountainside an hour and a half north of Hanoi. Saturday morning I ran some errands around Hanoi and realized just how much I’ve learned and gotten to know the city. I can tell if my taxi driver is going the right way, estimate the cost of cab fairs, and know how to do little things that are different from home but commonplace here (like getting a plastic bag stapled over your purse before shopping at some stores). Saturday afternoon we (Martha, Elizabeth, and I) went to work at Joma, a cafe that has become one of my favorite places in Hanoi, because it reminds me of home (Bread Co/Panera specifically). For the evening, we enjoyed some street food with friends. In between, I got to relax in my room and connect with home. It was just the Saturday I needed. Sunday, we explored the countryside and mountains with Elizabeth’s cousin Sarah and some of her students. We went everywhere by motorbike, and though I was rather sore and stiff by the end of the day, it was fun to rock my face mask (to block gas fumes) and exhilarating to feel the wind on my skin. Fall has come to Hanoi, not in the sense of leave changing colors, the need for sweaters, and pumpkin spice lattes, but the weather has cooled off some (the 80s during the day is better than the 90s) and the humidity has decreased, making the weather perfect for our day long adventure. We began our trip at Dai Lai Lake and took a boat to an island in its center. The lake was nestled in the countryside with the mountainside surrounding it, a picture of peace and beauty. We enjoyed a picnic and walking around a bit and then headed on our motorbikes to Tam Dao, a small mountain community and former French resort. Our motorbikes struggled a bit to get up the mountain, but the stunning views at the top were breathtaking and the mountain breeze was a refreshing change from polluted city air. 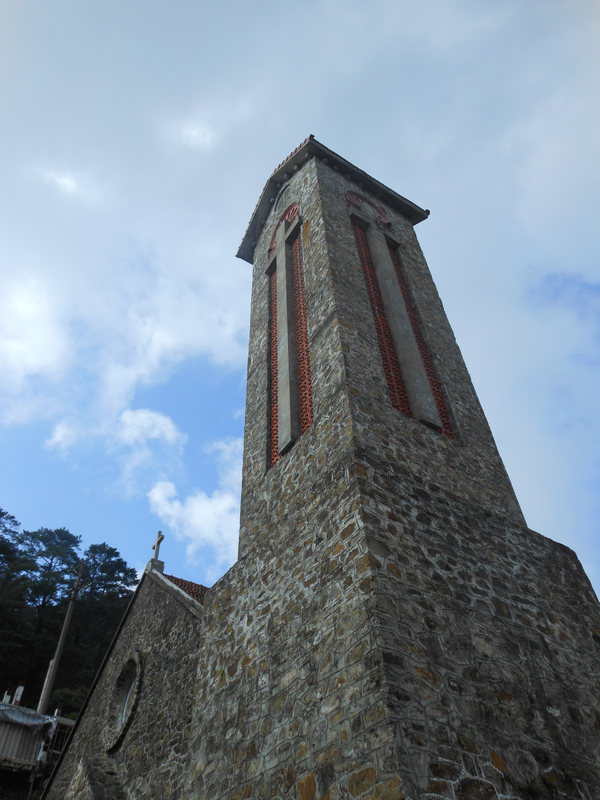 There was also a church at the top of the mountain, which was a rare site and comforting reminder of Who’s by my side each step of this journey in Vietnam. 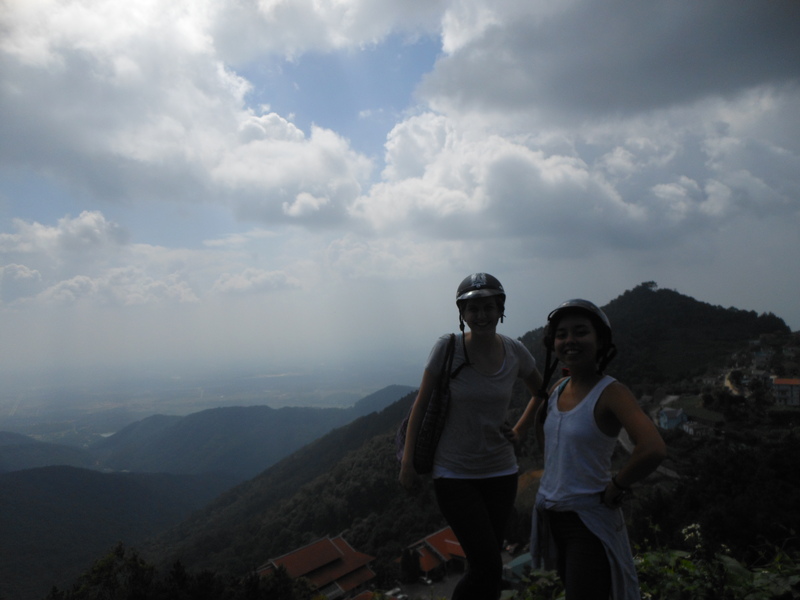 After enjoying the beautiful panorama of mountain views, we headed back down the mountain and back to Hanoi. You are my portion I know you are near. You are my portion I’m never alone. You are my promise; I know you are near. I’ve had blogging about the rest of our time in Cambodia on my list of things to do for the past few days now. I haven’t been able to figure out what to say though. Our time Siem Reap was full of fun and adventure and flew by, while our time in Phnom Penh was extremely sobering and at times seemed a bit too long. 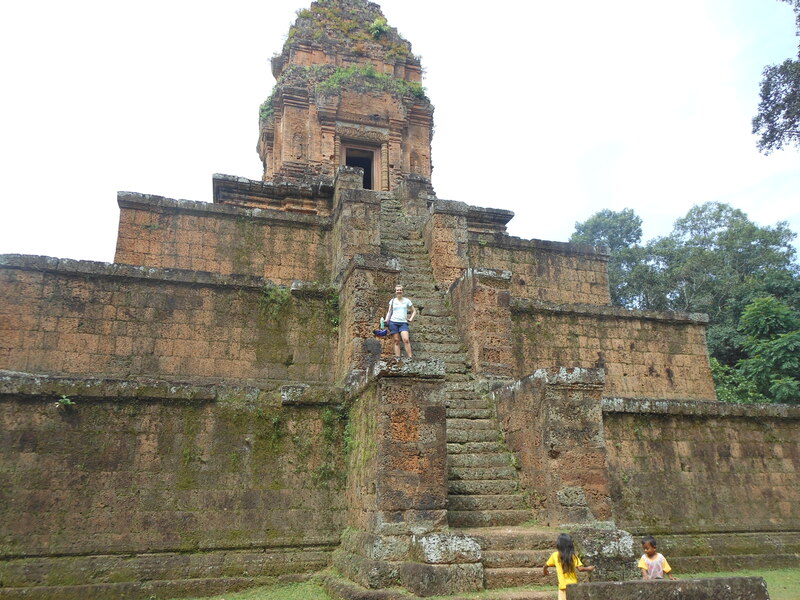 Before arriving in Southeast Asia, I didn’t know much about Cambodia’s history or people. I have a vague recollection of reading perhaps a paragraph or two about it back in AP World, and that’s about it. In the 1970s, Cambodia was ruled by the Khmer Rouge, a brutal force and perpetrator of genocide. During their rule, the Cambodian people were cleared from the cities and taken to work camps and killing fields where millions of people lost their lives. The horror of the country’s recent history was at the forefront of our minds throughout our visit. While in Phnom Penh, we visited Choeung Ek or as it is more commonly referred, The Killing Fields. While these former execution grounds are now designed as a site for remembrance and healing and surrounded by rice fields, it was harrowing to walk through a place and hear the stories of a place where thousands of innocent people lost their lives. Occasionally as we walked, we’d see bone fragments and pieces of cloth that had surfaced from the mass graves that fill the site, but I also saw butterflies, beautiful reminders of new life and hope in a place full of sorrow. The same day we also visited a school turned prison where the Khmer Rouge held and terrorized thousands of people. It was eery to walk through the classrooms they’d turned to cells and to see pictures of the hollow eyes of the victims. Even now, words fall short of describing visiting such places. We also visited more common tourist sites such as Grand Palace, temples, and National Museum, saw a traditional dance, and walked along the river while in Phnom Penh, but the harrowing history of a country still healing stood out to me most and won’t be soon forgotten. 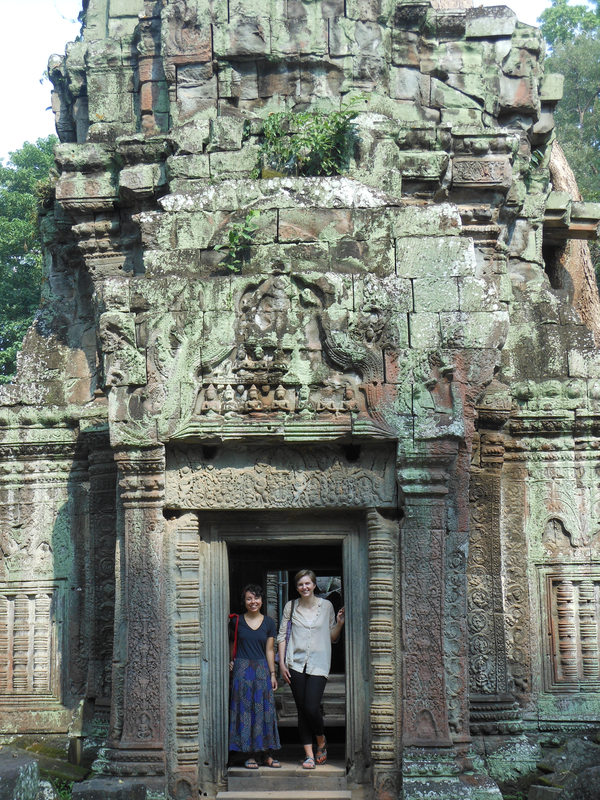 In Siem Reap, we spent our time primarily exploring the amazing temple ruins of Angkor Wat left from the 1st century. Countless temples each with a unique story and features fill the area. Some are crumbling and covered with tree roots, while others appear close to their original state through the conservation efforts of many countries. Sunday, we explored with the help of a local tour guide, who thought I looked like Taylor Swift. He showed us the lay of the land, provided historical context to what we were seeing, and pointed out details at each temple we might have otherwise missed. During the evening, we headed to the downtown area to check out Pub Street (where many of the restaurants are located) and the night market (full of tourist pants and trinkets). Monday, we rented bikes from our hotel and explored Angkor Wat and the city of Siem Reap at our own pace. We estimated that we biked about 40km, and every kilometer was worth it. By the end of our ride, I was sore, but proud of myself and so thankful to have our hotel’s pool to relax in for the rest of the afternoon. Tuesday, we woke up early to watch the sunrise over Angkor Wat. While the many other tourists took away from some of the ambiance, it was still a beautiful site. After resting and reading at our hotel for awhile, we hired a tuk tuk ( and spent the afternoon exploring more temple ruins further away from the city. Our favorites were the temples we could climb, because of the feeling of accomplishment when reaching the top and stunning views. Tuesday was our final day in Siem Reap, so we went out for dinner on Pub Street and had our favorite Blue Pumpkin ice cream one last time. Then we headed to Phare, the Cambodian Circus, which supports an art school for local children in need (www.pharecambodiancircus.org). The amazing acrobatics and performance were the perfect way to end our time in Siem Reap. Today, we made our way to Phnom Penh, the capital city of Cambodia for the second half of our trip. Our hostel isn’t at all like the resort we stayed at in Siem Reap, but we’re settling in and enjoyed our first night eating dinner and chatting (Elizabeth has the best conversation starters.) at a rooftop restaurant over looking the local river. This week was characterized by hours of work, lots of frustration, and a couple tears as I worked to complete the edTPA (the teaching assessment CUC requires all student teachers to submit) and technology issues made everything a bit harder. But now it’s over, and a weight has been lifted off my shoulder as I begin to enjoy a week off school in Cambodia for our fall break. Friday night in the midst of trying to get all of our work uploaded and submitted, Elizabeth and I experienced one of our favorite moments in Hanoi so far. Friday was the 60th anniversary of Liberation Day in Vietnam and marked by fireworks displays throughout the city of Hanoi, one of them happening just a couple blocks from our apartment. Around the time of the show, the roads to the front and side of our apartment completely filled with thousands of motorbikes, and the view from our 11th floor balcony became even more magnificent. At 9:00 the fireworks displays from around the city began, and we couldn’t contain our excitement as we saw the fireworks going off close to our apartment and 6 other displays from around the city. It was amazing to see the lights on the the cars and motorbikes filling the streets go off and be replaced by the lights of cellphone screens taking photos and to hear the ewws, ahhhs, and applause of all the people gathered. It was equally amazing to see the lights of the bikes turn back on and watch all the motorbikes returned to their regular flow of organized chaos. Now, we’re waking up from our first night in Siem Reap, Cambodia and anticipating a day at Angkor Wat and seeing the sites this beautiful country has to offer. Last night, we went to a cello concert by Dr. Beat Richner (http://www.beat-richner.ch/). He is an amazing doctor who has saved millions of children’s lives in Cambodia by providing quality medical care at no cost for any child who walks in one of the 5 hospitals he runs in Cambodia. His testimony was both heartbreaking and inspiring, and began our time here on a very thought-provoking note. It’s been almost two months since I arrived in Hanoi, and I can’t believe how the time has gone by and that I’m at the halfway point of my journey here. Yesterday evening on the bus ride back to the apartment, it struck me how parts of life that seemed out of the ordinary and made me uncomfortable when I arrived have become normal and how Hanoi has become my temporary home. It doesn’t seem so crazy seeing a pig roasting on the side of the road or a motorbike carrying a couch, because they can carry anything. While my weekend adventures are fun, so much of more of my life here is the small moments that can’t be captured on film. I spend the bookends of the school day on the bus with Concordia faculty. Every ride fills me with laughter and leads me to marvel how we’ve all been brought to Hanoi to share in the community at CISH. In the classroom, I often think I learn far more from my students than they learn from me. I almost cried happy tears this week when a student still learning the basics of English wrote a paragraph. Each Wednesday evening at Bible study, I’m blessed by an amazing community of faith. The adventure of the day to day is why I’m here, and the extra adventures along the way are an added benefit. I don’t want to paint everything as idyllic and easy though. There are moments I’ve cried in frustration over student teaching paperwork and the challenges of communicating with home, even with all the technology I have at my finger tips. There are days I’d love to be able to step in Target and Trader Joes to find just what I’m looking for in a designated aisle. Being tall and blonde means I don’t exactly fit in anywhere I go, and while many people know some English, there’s a language barrier almost everywhere. I wish my hands could reach through the computer screen for hugs. I often think of home, but also of how hard it will be to leave. 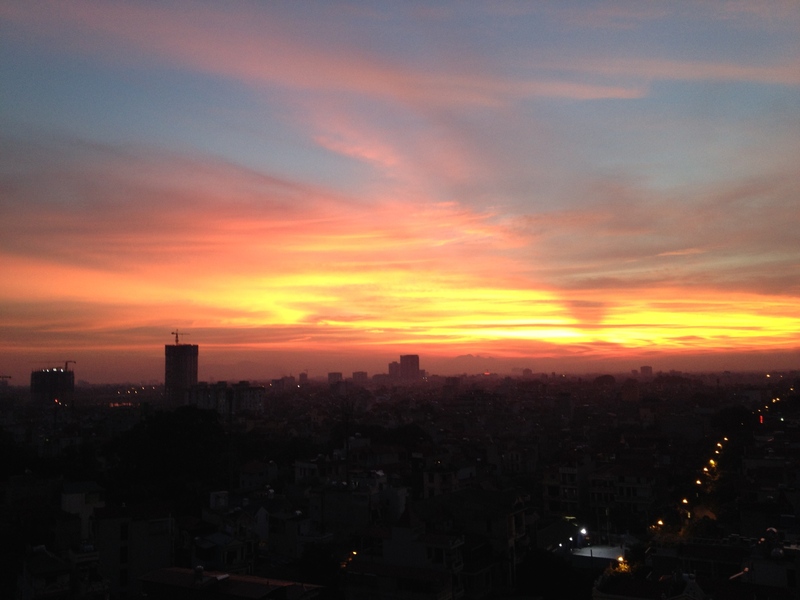 I sit in wonder as I reflect on my two months in Hanoi so far and consider the two months that lie ahead. As I try to live moment by moment, I’m thankful for His sustenance every step of the way on my journey.